Tomas Berdych defeated Kevin Anderson 6-4, 6-4 on Thursday to earn a SF date with Rafael Nadal. • For the first time since 2009 in Indian Wells there is an all-Top 10 semi-final and only the second time in the past 10 years at the BNP Paribas Open. World No. 1 Novak Djokovic takes on No. 7 Juan Martin del Potro and No. 5 Rafael Nadal faces No. 6 Tomas Berdych. • First up is No. 5 Nadal, who takes a 12-3 career record against No. 6 Berdych. Nadal has beaten Berdych 11 times in a row (including last six meetings on hard courts) after the Czech Republic native won three of the first four meetings. 2013 MATCH WINS LEADERS --- Berdych is at No. 2 in match wins on the ATP World Tour this season. Two-time BNP Paribas Open champion Rafael Nadal reached his fourth final at the Indian Wells Tennis Garden on Saturday, defeating sixth-ranked Tomas Berdych 6-4, 7-5. Nadal has won 12 straight matches in a row against Berdych and is one victory away from notching his 600th match win. "Today I was very nervous at the end of the match and was lucky that my serve worked amazing in the last game in the important moments," said Nadal. "There are some things that you need to adjust, and victories like today helps [me] a lot for [my] confidence." Nadal is bidding to lift his third consecutive trophy on the ATP World Tour during a remarkable comeback run from a left knee injury. After finishing runner-up in Vina del Mar (l. to Zeballos) to begin his season, Nadal claimed back-to-back titles in Sao Paulo (d. Nalbandian) and Acapulco (d. Ferrer). He is riding a 13-match win streak. "Coming back is certainly something amazing for me, totally unexpected, and I received more support than ever from the crowd every place that I played," Nadal said. "That's always a very, very special feeling. Thank you very much [to] all the people." Berdych was coming off back-to-back final appearances in Marseille (l. to Tsonga) and Dubai (l. to Djokovic). He dropped to an 18-5 season record and a 3-8 mark in ATP World Tour Masters 1000 semi-final matches. "It was a good tournament. I beat a couple of good guys and I had a good run," reflected Berdych. "My game was also very solid the last couple of weeks that I have been playing... But I'm still trying to push it more and more." The Spaniard had the upper hand for the majority of the match, until Berdych reached break point for the first time at 4-3 in the second set. Nadal tossed in a double fault to give the Czech an opportunity to serve out the set, but Nadal worked his forehand to break back and regain the momentum. Berdych framed an overhead to get broken at 5-all and subsequently missed four break point chances in the final game. Nadal claimed victory in one hour and 43 minutes. Tomas Berdych during his semi final match against Rafael Nadal in BNP Paribas Open at the Indian Wells Tennis Garden. Nadal won 6-4, 7-5. 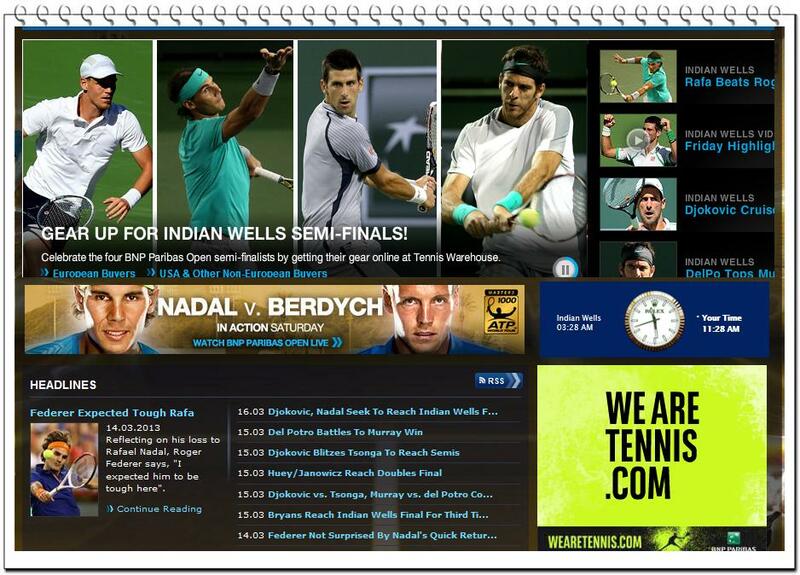 March 16, 2013 - Tomas Berdych discusses his straight-sets loss to Rafael Nadal on Saturday at the BNP Paribas Open. Q. Did Rafa's game change in any way since you played him last? TOMAS BERDYCH: No, nothing. He still play very aggressive, and what he was missing in his first matches when he come back after the injury ‑ or the time that he hasn't been on tour ‑ then, yeah, looks that he was maybe missing a bit of confidence in his game, but definitely not today and not anymore. You know, I think the only match that he was a bit struggling was with Gulbis, and then, you know, he just starts to feel his game as he did before. He played really good. Q. How closely have you been following his comeback? How much do you think all of the players been doing the same, curious how he's playing during all that time off? TOMAS BERDYCH: No, I have enough of, you know, doing good myself than following the other guys, what are they doing and if they are ready or not. This is not my job at all. I need to be focused on myself. I was not worried at all about him, that once he's gonna come back that he's gonna be strong again. Q. How do you think you played today? Q. But how do you think you played? TOMAS BERDYCH: Oh, me? I mean, it's known that actually his game is nothing that would suit to my game at all, you know. But I think that the biggest difference was in the second set when it was 5-3, and since that time I serve only one first serve and he serve only one second serve. That was the reason. Actually, that was the difference today. Q. Is there anything to stop him from just doing his usual run on clay and then going deep in Wimbledon? Do you see anything that could possibly stop that? TOMAS BERDYCH: No. I don't know. I mean, if he's gonna be ready and he's gonna be healthy, then, yes. I mean, there is nothing. I mean, he's a great player. He's the best one that we ever had on clay and winning slams on all the other hard courts, as well. I don't know. Q. What did you think on that overhead? Was it just the sun? Q. As far as movement about the court, did Rafa look like the Rafa of old today? TOMAS BERDYCH: Yeah, I think so. Yeah, I mean, he was moving quite well and I didn't see ‑‑maybe he will say something different because it's him, his body, and he has a feeling for that. No, but I think he looks strong again. Q. What do you think when someone comes back from seven months off and plays so well so quickly? Do you think they're just an incredible player? Do you think injury must not have been so bad? What do you think? TOMAS BERDYCH: (Smiling.) I mean, what should I think? As I said, I was not really following him, what he did at home and what he was doing, so I guess he make the right decision that once he decides to come back he's gonna be strong again to play. So it just show how great player he is. Q. What kind of positives will you take out of this tournament for yourself? TOMAS BERDYCH: Yeah, I mean, it was a good tournament. I mean, I beat a couple of good guys and I had a good run. My game was also very solid from the last couple of weeks that I have been playing. So, yeah, it was another good one in the row. But still, I'm looking to go a little bit more and still trying to push it more and more. So, next one is in Miami. Couple days off and get ready again. But besides that, so far it's my best result here, and that's always positive thing to have, you know, to improving your best result and best achievement. Yeah, it was a quite good week. Q. Is that a new watch?